Wouldn't we all like to have some insight into where the stock market is going? I am often asked if I know what the stock market will do. I would be the first to admit that I am not a psychic in that regard. But, I have known for some time that there are ways to predict the direction of the stock market. And no, I am not selling you some get rich scheme. These predictive insights come from the stock futures markets. The Chicago Mercantile Exchange (CME) trades stock market futures contracts. Specifically these futures contracts are for the S&P 500 and Nasdaq 100. You can often get an idea of how the stock market will do in early trading. The prediction that the CME tells you gets more accurate as you get closer to the opening of the stock markets. 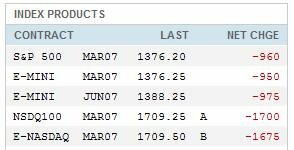 The CME website has a page that shows Globex Flash Quotes. These are quotes for indices. Because of the global nature of the Globex, quotes are often available after hours, and before the market opening. In the example above, large-valued red numbers for the S&P and Nasdaq futures portend a down day in the stock market. Green numbers would predict an up day. However, I will warn you that these "predictions" are only really accurate for about the first half-hour or so of trading. I am sure that you've seen it happen many times where the stock market opens up in the beginning and ends significantly lower. Or the stock market drops in the early minutes of trading, only to recover significantly before the end of the day. Other places to look for a predictions of the stock market are in the International Market indices. These indices tell you how the overseas markets are doing. If the markets in Asia and in Europe have had a down day, it is likely that the US markets will follow suit. As a side note here, my DW and I had the opportunity to visit the CME several years ago (before we were married) when we were visiting Chicago. Sadly, however, the CME visitor gallery where you can view traders on the floor of the exchange has closed to visitors since September 2001. Oh thats a nice prediction about stock market.